If it’s possible to feel excitement and hope with a touch of nagging anxiety and insecurity coursing through your veins all at the same time, chances are you may be on your way to your first day of work. Starting a new job is most often a positive experience as you have taken the initial step down an unknown and hopefully fruitful path in your career. At the same time, the unknown by its very nature has the potential to elicit a certain amount of nerves and tension. By entering this new workplace, you are leaving your former comfort zone and must engage with people, surroundings, and possibly work that are largely unfamiliar. This can be a daunting task for many. However, there is no true need to grin and bear your way through your first day of work. The following are some tips which will hopefully help you to have an enjoyable first day at work and make a great first impression. ere is no need to add any additional anxiety to your day if it is within your control. • Be Confident – Remember, you already got the job. The people who hired you believe in your ability. Make sure to believe in yourself as well. • Say Hello – Simply introduce yourself to at least a few colleagues. If you go out of your way to introduce yourself, others will appreciate it and often be more than willing to assist you in getting acclimated to your new surroundings. • Listen, Listen, Listen – Confidence and an outgoing demeanor will only take you so far. Paying attention to your job responsibilities, remembering co-workers’ names, and following company procedures will always reflect positively on you. • Appreciate the Opportunity – Keep in mind how fortunate you are to have landed this job. This grateful mindset will be mirrored in your actions, and others will be able to discern that you are happy to be there. If you follow these simple tips, your first day at work should be a memorable one and leave your colleagues with a great first impression of you. Now, on to day two. I agree with a lot of this. Be friendly, outgoing, ask questions, smile – all the common sense stuff. make sure you are outgoing and don’t hide! take the time to start meeting people and learning about the company and the people you will be working with. Smile, be friendly and make a good impression. The best thing you can do is to start off with a can-do attitude and ask questions. One of the helpful things about arriving early is that it calms the nerves. Sit in your car for a few minutes before going in to compose yourself and gather your thoughts. Being “new” is never fun because you just don’t have it all down yet and know it will take you a while to “get it”. Stay positive, smile, and give it your best! Soon someone else will be the “new” one! Just try not to be too shy and hide. This is your chance to start getting to know your coworkers and the company. Go in there with a smile and be friendly! Don’t let the jitters get the best of you. I’ve always found it helpful to take notes, since it can be hard to prioritize a tide of new information. This also helps to demonstrate your dedication to learning about your new position. Saying “Hello” is the best way to show your new coworkers that you’re confident and most importantly eager to learn. Dress to impress, be vocal be knowledgeable. Dress for the job you want, not the job you have. I agree with every point mentioned here. It is very wise to arrive a few minutes early not only to make a good impression but to also keep you in a good mood ( if you show up late on your first day, you may feel flustered/anxious and this can show on your face). Give yourself enough time to get there early so that you can be in a peaceful, happy mood. Also, say hello! Say hello to the receptionist, the building’s security guard… start yourself in a friendly mood before walking into your work space and once you get there, say “Good Morning.” Everyone knows who the “new guy” is, so why not exude confidence by being pleasant and cordial? 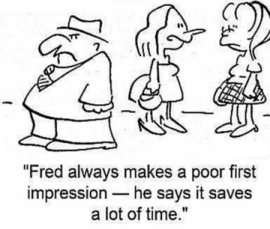 Making a good first impression is the best way to get yourself started on the right foot. These are definitely some really good tips! It helps to get to know the people you’re working with and make friends with them. It makes you feel less nervous. Also getting to work early is helpful so you can avoid feeling like you’re in a rush, and it allows you time to lessen anxiety. just be yourself. be friendly and try to get to know people. Arriving early really makes an impression. It shows you are focused and serious about being there. Be yourself. Smile. Ask questions. Don’t let your nerves get the best of you! You want to make sure you are friendly, but don’t get over the top. You don’t want to come across fake or trying too hard. Have a good breakfast, get to work early, dress your best and walk in with a smile. Make a good first impression and ask questions when needed. What a helpful, calming article. Thank you so much! This will absolutely help me ace my first day–if not the first week. It’s a lot to deal with and learn when beginning with a new place to work, but these outstanding tips will absolutely help! Next post: Is it Okay to Send a Thank You Email After an Interview?